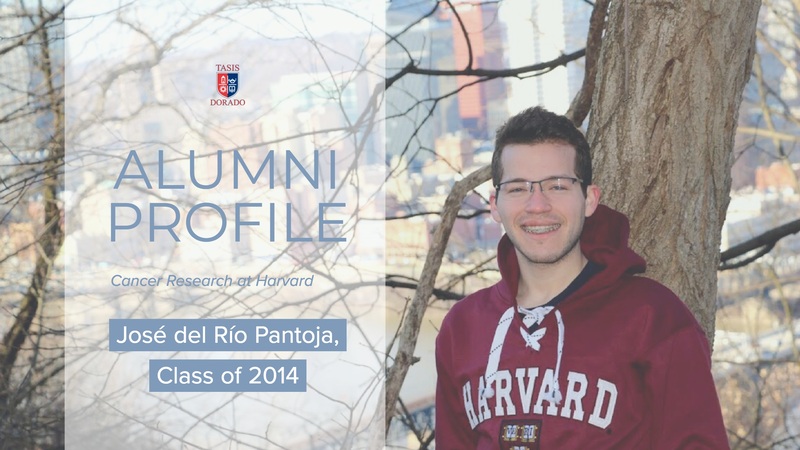 JOSÉ "Jochi" DEL RÍO PANTOJA, a graduate of TASIS Dorado in 2014 and one of our latest high flyers, is fervently probing the nanoscale mysteries of biochemistry. After weighing up offers to join several Ph.D. programs, he has settled on enjoying a full scholarship at Harvard University. This exciting research challenge tackles the structural role of proteins that cause cancer. What sparked your interest in biomedical research? I don't recall a specific instance that started my journey towards biomedical research, but then I have always been fascinated by STEM fields (Science, Technology, Engineering, and Math). My overall experience in STEM can be best described as a positive feedback loop: the more I learned about it, the more I wanted to know. I do believe, however, that my infatuation with the chemistry courses and research experiences at Penn State strongly shaped my interest in biomedical research. Did you think you might go down that path from the outset of your undergraduate studies? Not really. I started my undergraduate program at Penn State with the idea of becoming a physician but quickly switched to the Eberly College of Science at Penn State to study my current major in Biochemistry and Molecular Biology. It's been a gratifying journey that has also introduced me to the joys of teaching. I started out as a learning assistant in general and organic chemistry courses and worked up to a position at Penn State Learning as a study group leader in organic chemistry, teaching 100-200 students. It sounds like you barely had time for anything else! Well, I'd say it's been a very fulfilling time indeed, also allowing me the privilege to get involved in Alpha Epsilon Delta's Pre-professional Health Honor Society, promoting excellence in healthcare. We host speaker events and create community service opportunities and I've become heavily involved, most lately taking on the role of president. In addition, I've benefitted from the honors classes at the Schreyer Honors College, since being admitted there in my sophomore year. What were some of your highlights at TASIS Dorado? There are three highlights that come to my mind. The first is Annie (Galatzán); she was my number one highlight at TASIS Dorado. Whether it was her everlasting smile, wise advice, warm hugs, generous favors or quick ranting sessions, she always found a way of making me feel welcomed and loved. It was a true privilege to have met her. Then there's Spirit Week. I absolutely loved Spirit Week. From being able to dress according to the theme of the day to all the activities going on during that week, Spirit week was super fun. It certainly resonates as one of my favorite times at TASIS. And thirdly, there were the French classes with Madame Denisse (Cintrón) and Calculus class with Miss Wanda (Herrans). I LOVED French class with Madame Denisse. She managed to get me so into the course that I even agreed to sing in French for this one play we did in front of the entire student body and parents. It should be noted that I am not the greatest singer. That just goes to show how great a teacher she is. Also, her class enabled me to me to travel abroad to Nîmes, France as part of the TASIS Exchange Program, which is another huge highlight. As for Calculus class with Miss Wanda, she was the first teacher to introduce me to the importance of developing strong soft skills prior to entering college. She was also a friend and really cared about us developing our ability to succeed at learning. What do you know now that you wish you knew in High School? 1) Only participate in extracurricular activities that you actually enjoy. It is an absolute mistake to do things just because they are résumé boosters. Professional schools and employers can see through that. Most importantly, you jeopardize your college experience and overall happiness. 2) Dumb questions are only dumb if you don't ask them. You will find people that are great at making you feel inferior for asking a question or too many questions. But don't let that get in the way of you understanding the world, regardless of what field you go into. 3) Actively seek to understand what is really going on in the world you live in. I think you have a moral obligation to have an active role in topics that affect the world. Enroll in courses about race, immigration, sexual/gender orientation, world history, and social sciences. Think differently. Research. There are so many things going on right now that you can make a great impact on a micro and even macro scale. Knowledge is your biggest weapon. 4) Check your privilege. Privilege is unearned. It is an invisible system that we are all part of. It is very important to recognize your own privilege in order to recognize those who don't have the same privileges. Had I known this going into college, I would have done a few things slightly differently. Checking and recognizing your privilege enables you to not only succeed in the most fair and conscious manner but also keeps you aware of those who aren't as lucky as you are, whether it's because of their socioeconomic status, sexual orientation, skin color, gender, or whatever. As a consequence, you grow with society. 5) Be utterly proud of your roots. If you decide to go to a school in the United States, you will be tempted to blend into the culture you find there. In high school, I wish I had been more aware of the importance of being proud of my accent, my traditions, and my people. As you dive into "the real world", you owe it to yourself and your people to show the real world the beauties of what shaped you. Can you tell us a little about your research experiences to date? I started with research in my sophomore year at Dr. Amie Boal's lab, studying structural biology. We worked on the mechanism and structure of proteins that use metals to catalyze reactions. That led to my first scientific paper, which is undergoing peer review as we speak. Then last summer, I attended a research program at Dr. Shohei Koide's biochemistry and molecular pharmacology laboratory at NYU Lagone Medical Center, where I managed to map the structural landscape of a protein implicated in pancreatic cancer, along with a synthetic antibody created at the Koide laboratory. I gave an oral presentation of that work at the Leadership Alliance National Symposium and spread the word further with a poster at NYU Lagone Health. We congratulate you on starting your Ph.D. at Harvard. What are your goals? I really am grateful to be able to dedicate myself to science at Harvard and the fellowship covers all five years of the Ph.D. There will be many courses to attend and a lot of training in research. Hopefully, I'll get to teach too! My research goals will focus on the structure-function of proteins and the development of therapeutic strategies. What advice would you give to students who are interested in a career in biomedical research? 1) Find mentors that want to see you succeed. I wouldn't have accomplished half of the things I have if it weren't for my caring mentors. My research mentor at Penn State, Dr. Boal, introduced me to and guided me through the amazing world of chemistry and structural biology. Mentors like her are the ones that train you and connect you to bigger opportunities. 2) Try to get into a research laboratory as soon as possible. The earlier you do so, the experience you gain will either nurture your natural inclination towards the field or make it easier to switch career aspirations early on, resulting in the strongest possible résumé. 3) Sleep, nutrition, exercise, and fun should be priorities. You'd be surprised how easy it is to forget this one. Be sure to visit our Alumni Stories page often to see what your fellow alumni are doing. If you know of a fellow alumnus/a doing something interesting that you think our community would want to know about, please contact the Advancement Office at yegros.m@tasisdorado.com.